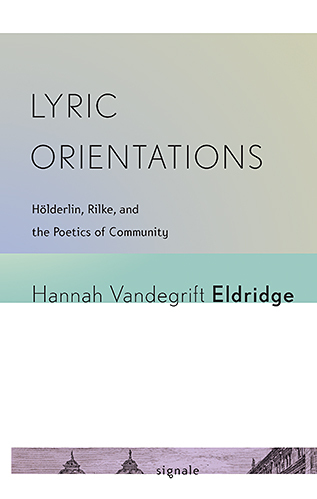 In Lyric Orientations, Hannah Vandegrift Eldridge explores the power of lyric poetry to stir the social and emotional lives of human beings in the face of the ineffable nature of our mortality. She focuses on two German-speaking masters of lyric prose and poetry: Friedrich Hölderlin (1770–1843) and Rainer Maria Rilke (1875–1926). While Hölderlin and Rilke are stylistically very different, each believes in the power of poetic language to orient us as social beings in contexts that otherwise can be alienating. They likewise share the conviction that such alienation cannot be overcome once and for all in any universal event. Both argue that to deny the uncertainty created by the absence of any such event (or to deny the alienation itself) is likewise to deny the particularly human condition of uncertainty and mortality. By drawing on the work of Stanley Cavell, who explores how language in all its formal aspects actually enables us to engage meaningfully with the world, Eldridge challenges poststructuralist scholarship, which stresses the limitations—even the failure—of language in the face of reality. Eldridge provides detailed readings of Hölderlin and Rilke and positions them in a broader narrative of modernity that helps make sense of their difficult and occasionally contradictory self-characterizations. Her account of the orienting and engaging capabilities of language reconciles the extraordinarily ambitious claims that Hölderlin and Rilke make for poetry—that it can create political communities, that it can change how humans relate to death, and that it can unite the sensual and intellectual components of human subjectivity—and the often difficult, fragmented, or hermetic nature of their individual poems. Hannah Vandegrift Eldridge is Assistant Professor of German at the University of Wisconsin–Madison.